Over the last 7-8 years, inflation has been quite substantial, yet by the public’s awareness of inflation, it has been mild to nonexistent. This hasn’t gone totally unnoticed, for if you ask the average American at what rate their cost of living has been increasing, most would reply, by at least 4% but likely 5% or higher, regardless of what the heavily-doctored CPI says. We can also look at asset prices over this time period, most notably the major stock market indices and real estate, the former having increased very substantially since the peak bubble levels in early 2008 (the Dow is up roughly 45-50%). Inflation, as defined using the modern-day definition can’t actually be measured, as it’s not possible to apply accurate weights to every good and service in the economy. The modern-day definition of inflation is an “increase in the price of goods and services”, whereas the classical definition of inflation is an “increase in the supply of money and credit.” Rising prices, both producer and consumer are the effectsof increases in the money supply- not the definition of inflation itself. The classical definition is more appropriate to use in this discussion (and really at all times) because in the causal relationship between an increasing money stock and prices (consumer and producer), the money stock is far more important. The classical definition has been met (as discussed below), however one ingredient has been missing in this equation post-2008-the velocity of money, also known as turnover. When the velocity of money is low or decreasing, it is representative of economic stagnation or contraction, whereas a high or increasing velocity is synonymous with a robust and expanding economy. Granted, there are parts of the domestic economy doing well, for example The Silicon Valley, but upon any real examination of the current economic landscape, the only conclusion one can draw is that the economy is very weak and extremely fragile, hence the Fed’s cautious approach with interest rates. It is quite absurd to make the argument the economy is strong, when the central bank is so incredibly cautious in hiking the fed funds rate by just 25 basis points, especially when it’s starting from record low levels and from a persistent negative real interest rate environment. While one could argue the economy has recovered or that it has been recovering, the facts speak for themselves. The labor market, the best indicator of economic expansion or contraction, is a nightmare for those seeking work or wishing to have full-time work, even though headline unemployment has been reduced to a level that is considered to be at “full employment.” This is because headline unemployment excludes the individual from the labor force once unemployment benefits run out. The labor participation rate, the proportion of the population included in the labor force relative to the population, dropped significantly from 2008-to-present and hasn’t recovered. Therefore, the headline unemployment rate essentially is useless when trying to gauge the health of the labor market. Further, the qualitative aspects of labor conditions need be accounted for if we wish to determine actual real world economic conditions. The fact that the quality has been deteriorating, as seen through the significant increase in part-time jobs, verifies the real situation. There is also a significant amount of anecdotal evidence that although many corporations are generating significant quantities of free cash flow, they aren’t investing in growth (capital investment in new plant, property and equipment), but instead are using this excess cash to buy back their own stock. In recent years, this has been quite substantial – and in most cases, has been done at bloated valuations. (i)	Money is a good that is universally accepted in exchange by market participants/unit of account. (ii)	Money is immediately available for use in exchange/redeemable in standard cash at a fixed rate. (iii)	Money serves as the final means of payment in all transactions , otherwise said as the final payment in the extinguishment of debt. If it can pass these tests, it is considered “money” and today that includes the currency component of M1, bank deposits/demand deposits (total checkable deposits and savings deposits) including those due to foreign commercial banks, foreign official institutions and U.S. government demand deposits and note balances. This is known as the “TMS ”/”True Money Supply” in the Austrian school of economics. Credit cards are excluded because the use of such in a purchase transaction simply creates another liability and therefore cannot be the final means of payment. Travelers’ checks are excluded because they also don’t serve as the final means of payment in a transaction as they are a credit claim on the assets of the issuer (iii). Money market mutual funds (MMMF’s) are also excluded because they fail to meet (ii) or (iii) as are time deposits as they fail to meet (ii) without incurring a penalty or discount to par. You get the idea. Growth of the “TMS” from 2007-present. 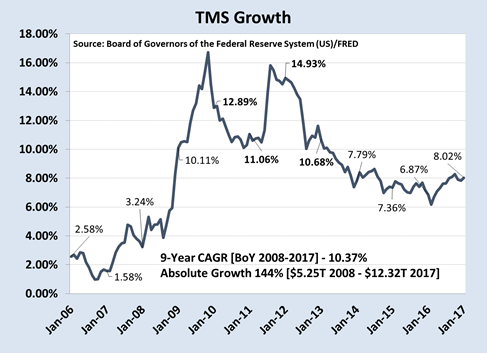 Now that we’ve defined the components of the money supply, let’s take a look at the growth of the “TMS” from 2007-present. From 2006-2008, inflation was minimal, peaking in 2011 as QE2 flooded the banks with excess reserves. In normal conditions, the excess reserves would have been used for massive credit expansion, but for the most part all the reserves injected into the system via QE1, QE2 and QE3 were used to keep the banks solvent. Nonetheless, the QE’s did cause the money supply to increase by a rather significant degree (see 2009-2013 where the money supply grew by 58%). 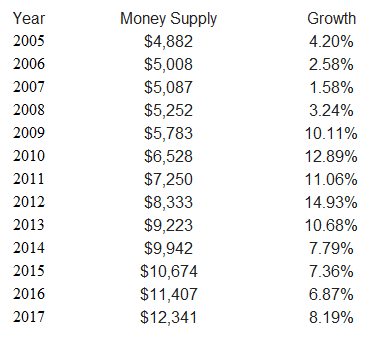 As we can see, the money supply has grown at a very robust pace, standing at $5.24T at the start of 2008 increasing 135% by Jan 2016 or a 9-year Compounded Annual Growth Rate (CAGR) of roughly 10%. As for credit; If you are to imagine credit from a financial perspective, it is equivalent to debt. Given that we live in a fractional reserve banking world, credit expansion is inflationary. Initially, post-2008, there was a deleveraging or contraction of credit. This was negated by bailouts (which peaked at over $20T). However credit did marginally contract until 2009 but did not reach pre-crisis levels until late 2011/early 2012, and has since been increasing at a healthy pace, seen primarily through national, consumer and corporate debt. To give you an idea, national debt, non-financial corporate debt, financial corporate and especially consumer debt have gone from roughly $48T in 2008 to upwards of $67T today. Thus-far, while growth in the supply of money and credit has been increasing at a robust rate, and has resulted in some producer and consumer price inflation, prices have not increased to nearly the same degree. This brings us back to a discussion as to which of Trump’s polices will most likely take place in the near future. It seems obvious to us that President Trump is a believer that government spending can stimulate the economy. While government spending can cause short-term illusions of growth, these will and have always been temporary, unsustainable and have for the most part, created make-work jobs… which are overwhelmingly unproductive in the long run. If he follows through with his massive fiscal stimulus plan, which is likely, this could create the illusion that economic expansion is in place, as it will create a lot of unsustainable jobs. In turn, this may increase consumer confidence. Investors need to watch for spending to increase, which means an increasing velocity of money. This will reveal the effects of all the monetary inflation that’s been placed into the banking system since the 2008 financial crisis. In this case, even if a negligible amount of monetary inflation takes place, it would still almost certainly lead to a significant rise in prices. Chris Marchese is Senior Equity Analyst for TheMorganReport.com and contributes to many on-line financial journals, subscription based commentary and magazines. These include Investor’s Digest Canada, The Prospector, Financial Sense, Howe Street, Gold/Silver Seek, among other and various podcasts. He continues to contribute to the investment community by writing for The Morgan Report blog. Chris has evaluated precious metals’ mines and exploration sites in various regions around the world. He contributed significantly to the book The Silver Manifesto and is a co-founder, director and analyst for the royalty and streaming company, Lemuria Royalties. Copyright © 2017 The Morgan Report - All Rights Reserved Disclaimer: The above is a matter of opinion provided for general information purposes only and is not intended as investment advice. Information and analysis above are derived from sources and utilising methods believed to be reliable, but we cannot accept responsibility for any losses you may incur as a result of this analysis. Individuals should consult with their personal financial advisors.